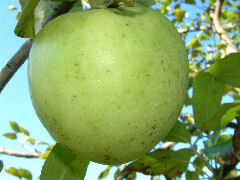 A very old southern apple thought to have come out of Virginia in the 1700’s, but its true origin is unclear. Interestingly, Virginia Greening was never recorded as being sold by any Virginia nursery under this name, but was sold by nurseries in other southern states. Fruit is medium to large with thick, tough, green skin with an occasional red blush on the sunny side and scattered large, reddish dots. Flesh is yellow, coarse, and sweet. Ripens in October and is a fine keeper.